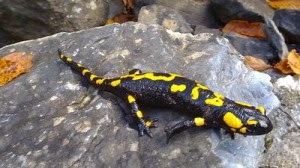 The global climate change has been blamed for yet another mishap, and that is salamanders in the Appalachian Mountains shrinking, researchers say. Research from the past few years has been showing more and more that our warmer planet may cause some species of plants and animals to grow to be a smaller size. The salamander, already a creature under distress, seems to have decreased in size in the past 30 years, particularly in areas where the climate has gotten drier and hotter.